Many academic institutions, research hospitals, and government and private research labs use a variety of specialty gases in their facilities. These gases are often supplied from a centralized location and then distributed to individual labs via a network of piping. Cost accounting for gas consumption is always difficult, but essential because the labs are generally structured and measured as separate cost centres. FCI’s thermal dispersion ST100L Series Air/Gas Flow Meter combined with an integral Vortab Flow Conditioner is an ideal solution for laboratory gas sub-metering applications with variable usage or very low flows. FCI flow meters measure flow rates as low as 0.07 NMPS and as high as 305 NMPS with up to 1000:1 turndown. They are calibration-matched to specific mixed gas compositions. For example, a major university wanted to install point-of-use gas mass flow meters on its nitrogen distribution pipes to measure usage more accurately and assign cost by department. The nitrogen usage, however, varied widely depending on factors such as class size, but it all added up to a large amount of nitrogen consumption. To meet the challenge, ST100 Flow Meters with FP sensor heads and integral Vortab Flow Conditioner spool-pieces were installed on a 25mm central gas distribution line feeding the individual labs. The meter was performance optimized for use in nitrogen and offered a wide turndown. The built-in flow conditioner created a repeatable and distortion-free flow profile throughout the entire gas flow range, including the low flow rates to ensure accurate measurement. The best-in-class digital/graphical LCD provided staff with a continuous, easy-to-read local readout of flow rate and totalized flow. 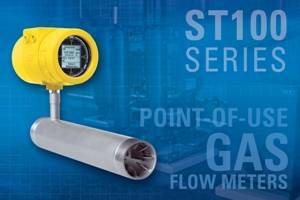 The ST100 Flow Meter Series sets a new industry bench mark in facilities and plants for air/gas flow measurement, offering the most feature-rich and function-rich electronics available. The ST100’s performance delivers unsurpassed adaptability and value to meet gas flow measurement applications for today and tomorrow. Whether the need is for 4-20 mA analogue, frequency/pulse or digital bus communications such as HART, Fieldbus, Profibus or Modbus, the ST100 is the solution. The ST100 Flow Meter’s unique graphical, multivariable, backlit LCD display/readout brings new meaning to the term “process information”. It provides the industry’s most comprehensive information with a continuous display of all process measurements, alarm status and the ability to interrogate for service diagnostics. Also standard in ST100 is an on-board data logger capable of storing up to 21 million readings of any or all measurements. The logged data is easily retrievable from a removable 2-GB micro-SD memory card or by uploading from the unit’s USB port. The ST100 can be calibrated to measure virtually any process gas, including wet gas, mixed gases and dirty gases. The basic insertion style air/gas meter features a no moving parts, non-clogging thermal flow sensing element and accuracy of ±0.75 percent of reading, ±0.5 percent of full scale and repeatability of ±0.5 percent fs. Designed for rugged industrial processes and plants, ST100 Flow Meters include service up to 454ºC and are available with both integral and remote 300 meters electronics versions. The ST100 is agency approved for hazardous environments, including the entire instrument, the transmitter and the rugged NEMA 4X/IP67 rated enclosure. Instrument approvals include FM, FMc, ATEX, IECEx, NEPSI, Inmetro, and GOST. Its bus communications are registered devices with their respective standards bodies and the ST100 has been independently evaluated to meet SIL 1 compliance.